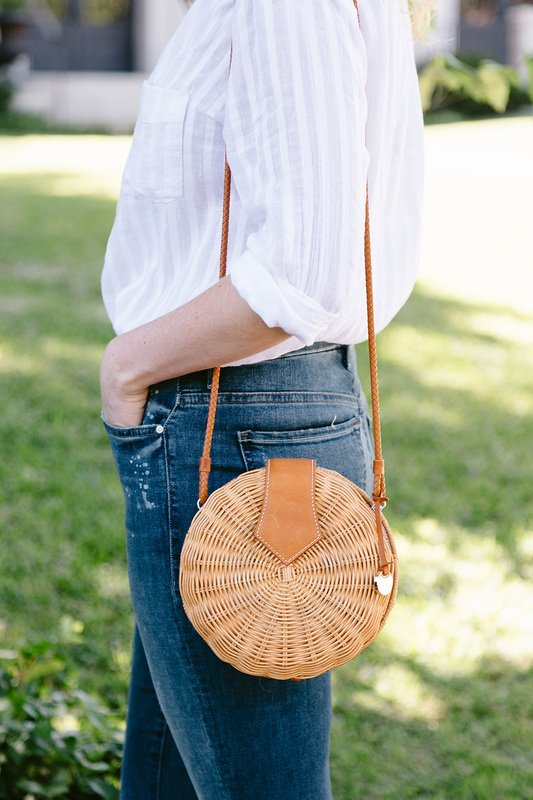 As I’ve mentioned before, my day-to-day wardrobe usually consists of a comfy pair of jeans, an effortless top and chic accessories. It keeps me comfortable at my desk, but I’m always ready for anything should a meeting arise, unexpected errands come up, or a last minute get together with friends hops on the schedule. Breezy shirts like this button down are exactly what I reach for, especially as we move into the warmer months of summer. This shirt is super lightweight and goes with just about anything. It’s great for throwing over a bikini with shorts or a skirt for the beach, but obviously looks casual and cool with a good pair of jeans (this pair is a current fave – love the subtle paint splatter accents, and the fit is incredible!). I’m also looking forward to pairing it with white denim and some of my more colorful accessories later this season! 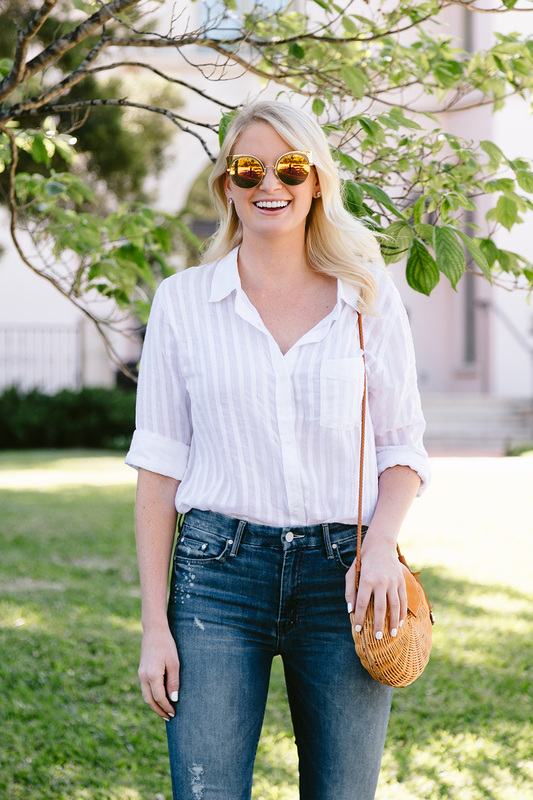 This short-sleeve popover is such an easy staple to pair with jeans or white shorts this summer. Did I mention it’s under $70? I love the swiss dot details on this utility shirt from LOFT! Such a sweet accent. Nothing like a cool linen-blend shirt to put you in the summer state of mind! I wore this Treasure & Bond crinkle shirt over the weekend to the Food & Wine festival. I love the split siding, which allows me to tuck in the front and leave the back untucked! 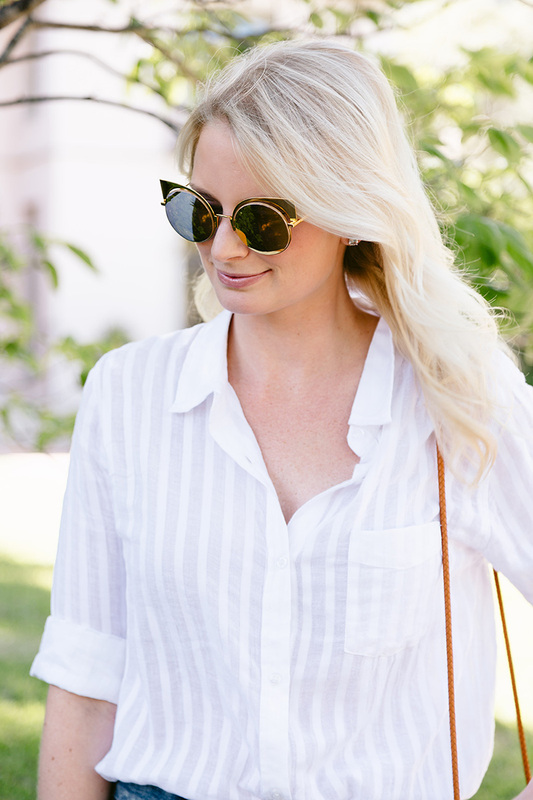 This tie-front blue + white striped shirt is a warm weather essential! So cute. Loving the contrasting trim on this crisp button-down. A wonderful workwear go-to! Love this classic outfit so much, Merritt, mostly how the fit is perfection on everything. Makes such a difference. You have the best classic pieces and outfits! Love this one! I love how simple but chic this outfit is! I’ve been eyeing that J.Mclaughlin bag and love how you styled it! This is such a classic chic look! I’m obsessed with your handbag! I want everything you are wearing! Those shoes are too cute!